On July 10, Ambassador Liu met with the members of the 12th China Executive Leadership Programme (CELP) at the embassy, and had a discussion with them on China-UK relations, business cooperation, and other issues. Ambassador Liu extended a warm welcome to the members. 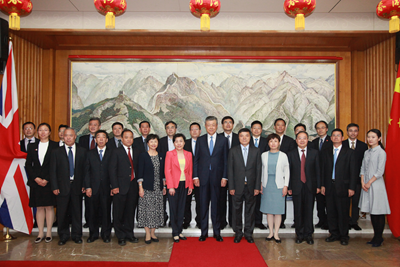 Hailing CELP as a "signature project", he noted that CELP has had 11 classes over the years and trained more than 250 senior managers and executives for Chinese enterprises. Three weeks of study and exchanges will offer a better insight into the politics, economy, and culture of Britain, the operation and management of multinational companies, and the opportunities and challenges that enterprises are facing as they seek to "go global". Ambassador Liu talked about the current development of China-UK relations. He pointed out that this year marks the 45th anniversary of China-UK ambassadorial relations, and it is also a year for consolidating the "Golden Era" of China-UK ties. The result-based cooperation in various fields between the two countries has been making new progress. Despite the uncertainties in Britain, such as the Brexit, the general direction of the "Golden Era" in China-UK relations will remain unchanged, and the good momentum for strengthening exchanges and cooperation between China and Britain will remain unchanged. The sound and stable development of China-UK relations has created new opportunities for cooperation between Chinese and British enterprises. He hoped that all the members of CELP 2017 could learn something from this programme and apply what they have learned. 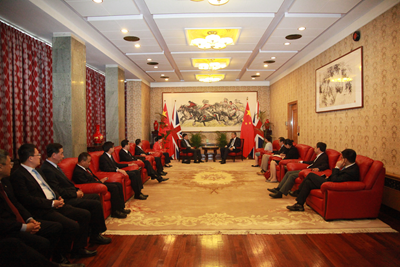 He encouraged them to take actions to promote cooperation between China and Britain in the areas of economy, trade, finance, communication, energy and the Belt and Road Initiative, and work for the stable and healthy growth of China-UK relations. Ju Weimin, the head of CELP delegation and Deputy General Manager of China Investment Corporation thanked Ambassador Liu and the Embassy for attaching great importance to CELP and talked about the managements of the programme. CELP 2017 consists of senior executives from more than 20 large-scale Chinese enterprises in manufacture, communication, energy, finance and aviation. Through this programme, they have expanded their horizons, opened up their minds, and gained more in-depth understanding of the development of China-UK relations and what Chinese enterprises could do to expand "global business". They will continue to improve their management capabilities, further enhance the international competitiveness of their enterprises, promote the internationalization of Chinese enterprises and contribute to China-UK economic and trade cooperation. Ambassador Liu also exchanged views with the members on the development of China-UK relations after Brexit, the status of London as an international financial centre, and other issues.